Decorate-Redecorate.Com - Just for Real Estate Agents! How to Dramatically Increase the Number of Listings You Get and Sell Homes Faster for More Profit with Home Staging Advice! There are many reasons why some agents excel and others struggle. I'm only going to deal with one reason which has recently surged to the top of the list. It has to do with home staging, the art of professionally preparing a home before you put it on the market for sale. One agent (who sells multi-million dollar properties) recently wrote, "It has often taken 3x's longer to sell without proper staging. Sometimes they don't sell at all. My average time on the market with staging is 90 days." Statistics prove over and over again that those agents who acknowledge the importance of home staging to the sellers they work with not only sell homes more effectively but at higher prices on average and in faster time frames. So it's no wonder agents are scrambling to find some one to teach them about home staging. But until now, agents were left to take a pricey seminar or class (which often taught very little and was little more than a positive thinking presentation). Or they had to take a home staging business seminar, class or web based training program or buy a book on doing home staging as a business and then make the applications fit for them. Those days are now gone! Best Selling Staging Author Barbara Jennings Will Teach You How to Offer Dynamic Staging Advice to DIY Sellers! Now at last there is a book written specifically to real estate agents and brokers that teaches you the basics of home staging. Don't misunderstand. This is not a guide on how to become a professional home stager. You will need more training than what this guide covers to start your own business. It's an introduction to the concept and implementation of home staging as a viable strategy for selling a home. If you're an agent or broker looking to add staging advice as an arsenal to gain a competitive edge and help your sellers at the same time, this is the guide you've been waiting to be written. And it's the only one in existence. It is not meant as a substitute to learning the full scope to run a staging business. But it is an introductory primer, so to speak, to get you involved and comfortable with promoting staging as a concept to your clients. It covers all the basic topics you should know, including some design advice (which most seminars and classes avoid). It's not all inclusive, cause you don't need to know everything to give good superficial advice. But it covers the essential topics that will put you way ahead of other agents who ignore this strategy - who don't know anything about home staging or who don't believe in it or who have never even heard of it. "Hello Barbara, I just wanted to send along a quick note of thanks. I recently finished my first staging job for a one bedroom apartment in Queens, NYC. I've been an interior designer and visual merchandiser for several years, but this was an interesting challenge for me. Your home staging book provided a lot of guidance as far as what questions to ask, resources to use and how to coordinate my project. I spoke with the broker who said that before hiring me the apartment had been on the market for several months with no offers. Within 10 days of completing the job they had 3 offers! Thanks again, Christine Schwalm"
Now this book isn't going to turn you into a Christine Schwalm. But most agents don't want to stage homes - however they do want to know a little more about the process so they can best advise their clients on whether a professional stager is needed or not. 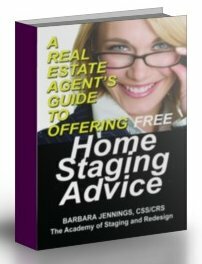 I believe that any agent that reads this guide will become a believer in the importance and necessity of using staging concepts routinely, and that readers (and clients) will naturally want to hire professional stagers who have been trained by the same person who wrote this guide so that everyone is on the same page, so to speak. Instead of paying upwards of $300 or more for a class or seminar, which often give you watered-down information or just a few handouts, this guide doesn't hold back. Barbara Jennings is famous for giving you detailed information on precisely what you need to know. The book is also full of photos to help you visualize what you're learning. TESTIMONIALS - "Enjoyed it and learned great tips. I received great pointers. - Marguerite Ann Spreckelsen, CREHSA, Palm Coast, FL"
"I've found the book to be really interesting and very helpful. I think it is something every real estate agent should go through and be able to offer this service to their clients. I’ve always offered advice to my clients on what would make their house show better but now I am much more confident in giving the advice and I find my clients are much more apt to follow my advice. I thought the book was very educational and well laid out. I learned quite a few things and I think the most important thing I’ve gained is the confidence to know what to tell clients when they ask what they should do before listing. - Chandra Classen, Saskatoon, SK, Canada"
But this isn't all. You can also choose to go through our certification process (just for agents) and earn our newest designation CREHSA (Certified Real Estate Home Staging Advisor), sanctioned by the Academy of Staging and Redesign. It's different from our professional stager's designation. It's easy to achieve. Read the book, pass the exam, pay the nominal fee and show proof of a valid and current real estate license. That's all there is to it. Use this powerful designation in your marketing tactics and to help launch you above your competition. Buy the book alone or buy the book along with paying your certification fee of $100. You'll be sent the exam immediately (once you fax us your real estate license) so you can pre-read the questions. As you read the book, you'll know exactly what answers to watch for so passing the exam will be easy. Then after you finish reading the book, take the exam (no time limit, honor system), submit it back to us via email. Once approved you'll have a powerful designation to use to market your services and it will give you enormous credibility with sellers cause all your answers will come with great authority sanctioned by the Academy. In these tough economic times, you need every edge you can get. Home staging is a well documented, highly successful strategy when selling a home. Don't be left behind. You don't have to become a stager yourself - you just have to know how to give solid advice! "I learned a LOT. I understand the importance of home staging so much better now and will communicate it to my potential clients using very powerful stats from the book. I learned important principles and concepts of home staging and feel I an ready to apply them in real houses. . . . I do feel I can make recommendations to the sellers and explain WHY I recommend specific tasks to be done. I also feel if I see the preparations for the market will be overwhelming for the sellers to do it themselves I can explain all benefits of using professional help. . . . Quite honestly, I think you are doing wonderful job. I really like the book and the way it is written. It shows deep knowledge of the subject and passion for home staging. Thank you for all the knowledge I have gained and for considering my application! 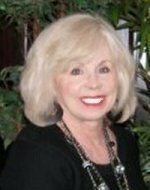 - Elvina Amati, Ithaca, NY (Warren Real Estate)"
TESTIMONIAL - "The book and training was very thorough, concise, organized and made good common sense. - Sheryl Scott, CREHSA, Austin, TX"
So don't wait a minute longer. Get the training everyone is clamoring for so you're not behind the curve. You don't have to do staging yourself. You can hire a professional. But you owe it to your seller to get them the best advice for marketing their property that you can give them. The dividends will pay for themselves thousands of times over. To order your copy of the book (and designation), see the links below. The fastest way to order is directly from the Secure Server Order Form links below. Keep in mind that when you use our Secure Servers, your information is safe and is never given or sold to anyone for any purpose. Never! Our Shopping Cart is hosted at a secure site called Veracart.Com and all information posted is automatically encrypted for your security. NOTE: If you live in a foreign country other than Canada, please use the Canada link to order. Any additional shipping to your country will be processed separately. P.S. - Remember You Need to Stand Out Against Your Competition! QUESTION: "Hi Barbara, I've just logged on to your monthly newsletter and discovered that you have written another book. I have to say that I'm somewhat confused. Whilst you insist that it is not by any means a course on home staging, it does list all the things a realtor needs to know. Don't you think that this will harm the actual home stagers business that have invested in your course and like me spent quite a lot of money on your previous books, that you turn around and write a book for realtors on how to give free home staging advice. Surely when they get their paws on the book they won't employ a home stager at all. Kind Regards, Confused"
ANSWER: Dear Confused, I guess some stagers will look upon this as unfair when it is quite the opposite. The book teaches realtors about staging, why it works, how it works, when they should defer to professionals, where to locate those professionals, and if (and only if) hiring a stager is out of the question, how to give good advice so that the seller gets the best help possible. The books specifically directs realtors to our two online directories where they can contact stagers who have been trained by the Academy. Since realtors are the most influential people in a selling transaction of a home, it is imperative they understand staging concepts so they can properly guide sellers to hire professionals rather than doing the staging themselves. I believe the person most vulnerable is the seller. The person everyone should be concentrating on helping is the seller, whether it be the agent or the stager or both working together. I've had many stagers buy the book to share with the agents they are trying to reach. So you can look on it as competition or you can look on it has a tool to help you to help agents and sellers alike. Realtors and stagers need to partner in educating and guiding sellers. Nowadays people expect service industries to educate them, to seek to service them to the fullest. When they do, they make money. When they don't they lose out to those who do. Does the book teach them how to be stagers? Certainly not. But it does help them understand the service and know the difference between complementary advice and professional staging services and benefits. I hope this helps stagers understand the intent and reasoning behind the writing of the book. The book urges readers to take a course if they want to become a stager. The book identifies my two directories should they be looking for a stager. The book promotes the status of stagers who have taken a course. It's good for everyone, but most specifically the client - the seller - the person everyone hopes to help. In addition to this, I'm not the first trainer to reach out to agents. There are 2 and 3-day seminars offered elsewhere. There are others offering $200-350+ "courses" and affiliations and all sorts of promises already out there. I'm hoping to encourage agents everywhere to hire the stagers trained by the Academy because then I know they will be in good hands - and if they have clients who cannot afford staging services, they will be better trained to help them than if they took a seminar somewhere with no design training and no serious knowledge or understanding of what's involved.